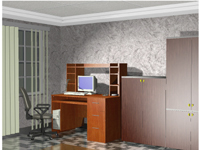 CAD Woody is intended for design of case furniture using sheet materials (WCB, WFB, MDF, glass). Interactive user-friendly designing based on the three-dimensional modeling is supported. The system ensures designing based on illustrative images, obtaining the drawings of the parts and specifications on the product under development. The design is performed with creation of parts of arbitrary or fixed size in the orthogonal space of grid axes. Parts may also be fronts with volumetric milling, glazing, tracery lattices. In addition, RM-measured parts of table-top type having arbitrary cross-sections are modeled. Editing of the product by moving individual parts or group parts. At the same time, automatically adjusted are the sizes of the adjoining parts, position of accessories, and drawings. The pre-set dimension of products are controlled automatically. Parametrical design of the curved outline parts by using extended set of external programs in Java script. The parameters are managed in dialog. The outline is automatically adjusted to the changes in the parts' sizes as per any rules, described in the script. You may rotate the outline with 90 degrees step and symmetrization relative to vertical and horizontal axes of the part. In the automatic mode, joining of the parts with one another considering process and functional offset is simulated. Opportunity to edit backlashes in correspondence with the pre-set process limitations. Automatic matching and installation of fastening, decorative, and other accessories is performed. At the same time, type, width, material and joining method of the parts are taken into account. Automatic spatial orientation of the accessories considering the position of joined parts, adjustment of process and functional offsets is performed as per the accessories used. Slot joining of the parts is supported. Automatic alignment of the fittings with recording of the process requirements: step of spindles and width of drilling machine bases, minimum indents from edges, and symmetrization. 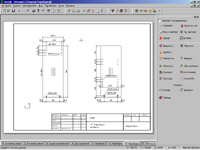 Automatic modelling of different type drawers design. Drawers design procedures are built based on the open architecture principles, specified in Java script and communicate with the model via automation classes. This allows to promptly adapt the system to the specific design of drawers for each user. Manual installation of additional accessories (locks, handles) in the drawer models is supported. Application of plain edges and shaped edges is modelled. For curved edges, the relevant milling part edges are modelled. Dimensions of edges are taken into account automatically at calculation of the dimension for blank parts (sawing dimensions). The drawings of the parts are formed automatically. On the drawings, the part is displayed in minimum, but sufficient number of projections. The dimensions, directions of textures, applied edge with the indication of the edging sequence for the sides, holes for fasteners, slots with the indication of quantity, depth, and diameter of holes, width groove, stiles and rails of holes to the edge part are indicated. Process and other contours are applied as described in the accessories related with the parts. Automatic recognition of identical parts in the product is supported with the purpose to minimize the quantity of the drawings. Manual editing of the drawings is provided: moving of drawing elements, drawing and setting of dimensions, moving and deleting of inscriptions and dimension lines. The specifications are generated automatically. Free-form specifications in HTML format are generated by a set Java scripts, using automation classes for model access. The specifications reflect the dimensions and saw part sizes, material consumption, edges, accessories, edging sequences of the parts' sides, prices, cost in any currency with a possibility of prompt adjustment of the currency exchange rate. The specifications on accessories indicate the configuration and cost of component parts. Printing of the drawings parts, specifications and illustrative images is performed with and/or without invisible lines deleting in wire mode, allowing to see internal design. Illustrative images specify overall dimensions of the products. You may make a part temporarily invisible. The database editor of accessories and materials allows to add new material, edit its properties, duplicate, apply style, remove style, delete from database. Automatic import from data sources allows to import material properties from the database of different format. For instance, you may update the prices on materials in the designer base according to the information from other databases. 3D models export in DXF and STG format. Export of illustrative images in BMP, JPEG, and TGA formats. Export of drawings into WMF and EMF. Export of specifications into HTML. 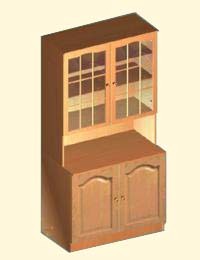 Woody helps solve many problems, related to design and manufacturing of the case furniture, effectively and comprehensively. The program supports only metric units. All dimensions on the drafts and specifications are indicated in decimal format. 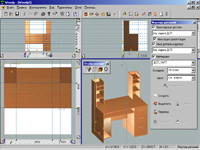 Convenient, intuitive interface of the editor allows to design individual products (case, desk, wooden beds etc.) in 5-10 minutes. All documentation necessary for manufacturing is generated automatically. Single button pressing results in automatic generation of the detailed drawings. Another button pressing will deliver the specifications. For each product part the program creates minimum, but sufficient number of orthogonal projections, sets dimension, designates holes and their stiles and rails, groove, edge, direction of textures, etc. This very labor-consuming and responsible process is performed in a matter of seconds! The program automatically detects identical parts, thereby minimizing the number of drawing sheets. The specifications include lists of product parts and used materials: WCPs, edge tape, fastening, and other accessories. For each part, material, overall, and sawn dimensions are specified. The product part list may be exported into the database shared by Woody and Sawyer laying-out application, so that to exclude manual input of blank sizes for obtaining of the layout chart. Calculating the expenditure of materials and the cost price of the products, different coefficients and formulas are used, as well as currency exchange rate is taken into account. Woody gives an opportunity to export three-dimensional models into the other computer-aided design systems tools via files in DXF format. For illustrative graphic systems, we support export of images into JPEG, TGA, BMP and other formats. The system relies on the design database. This database specified the used materials, fasteners, and rules of their application and installation. The database is stored in the MDB (MS Access) format and, at will, may be edited by the user directly. Today, Woody relies on powerful database, counting hundreds of materials from popular manufacturers, for instance: Blum, Bucina, Grass, Hafele, Hettich, Huwil, Indaux, Interspan, Kronopol, Titus, TM, Unitecno, ZPW Grajevo and others. Automated tools are available to import the information on materials (sheet, accessories, edges) from user database and to update these data (prices, availability in the warehouse etc.). Therefore, the designer creates products from specific materials with the known properties and appearance. The designer can see instantly, what the product will look like, as the designing is performed based on color textured illustrative images, accelerated by OpenGL&® graphic interface. The system may be adapted to design and process style of the furniture, produced by any specific manufacturer. Options are supported by selection of subsets of materials, fasteners and rules of their application and installation, specific for the given furniture manufacturer, from a general set stored in the database. Java Script interface for drawer modelling allows to adapt the system to specific manufacturers of furniture, taking into account its technology and specific features of drawers they design. Java Script interface of the report generator allows to create free-form specifications, to integrate with other, for instance, with accounting or warehouse applications. Rules of materials application allow, for instance, selecting the specific type of WCP at designing of parts having certain function. The rules of parts joining ensure automatic correction of the joining for newly created parts with those already existing in the product. Suitable accessories for attachments parts are selected automatically. At the same time, if applicable for the given accessories, process and operating laps and backlashes are set automatically. 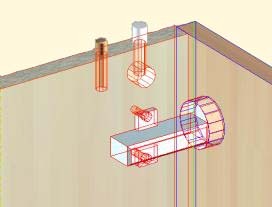 When installing the accessoires to the product model, the drawings of the parts related therewith will automatically show marks for fastener holes with indication of their diameter, depth, stiles and rails relative to the part edges. The step compliance is supported for holes in case of multispindle drilling machine tools are used. 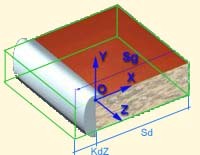 Fragment of the product models image in three-dimensional view. Red color highlights the selected accessories (loop), side part and holes in it. Dark blue color highlights door and hole therein. Vertical green line shows the joint axis of the door and side-board. The cover of the product is made temporarily invisible. The stiles and rails of the holes to the part edges are indicated. 1 - holes for dowel and minifix stem. 2 - hole for the minifix head (diameter and depth are indicated). 4 - holes for screws of hinges fastening. All diameters and depths may be optional indicated in the drawing. Assignment of edges on the end faces of the parts employs automatic and semi-automatic tools, which take into account functionality of the part, material type, method of joining with adjoining parts, and offset. At every single stage of design, the user may automatically adjust the model, or perform this stage completely "by hand". Combining these features you may obtain optimal desirable result. Once created model may be written to a file and then used as a sample at designing others similar products whereby repeated design operations are eliminated. So, for instance, change in the height of the case will automatically set the increase in the dimension of its side-boards, doors and back walls. At the same time, the program will automatically set additional hinges, adjust the positions of dowels, minifixes etc. When the designer moves any part, the sizes of the parts adjoining therewith, are adjusted automatically to ensure correct joining. The accessories follow the parts, to which they are attached. Moving of the accessories on the illustrative images entails immediate adjustment of the images on the drawings of the parts, changing in the location dimensions of the holes. Parametrization of the curved outlines for the parts using external programs in Java script not only allows easy adding of the outline library, but also provides for an opportunity of non-proportional (by scaling) and algorithmic adjustment of the outline depending on the parts' sizes. This means that at changing of the dimensional part, the size in broad limits, radiuses of curves or other parameters of the shapes may remain the same, vary discretely or as per any formula. The system supports correctness check of the formed product model as a whole. This function, applying the known rules to different nodes, finds doubtful aspects in the designed product model and brings them to the attention of the user. Using this function allows avoiding many errors at the design stage and facilitate problem-free assembly. The Woody program, in particular, gives an opportunity of modeling the milled fronts and glazed doors. The models of doors' fronts may have smoothly changing dimensions, adjustable to product dimension. The fronts and doors of standard (fixed) dimensions are also supported possibility of their piece-by-piece record-keeping in the specifications. In case parts of the fixed dimension are used, the products will be adjusted automatically. Woody enables modelling the edges of the curved outlines and profile milling at part edges' manufacturing. The stiles and rails, and parameters of curved edges are adjusted flexibly. They are taken into account at calculation if sawing parts' sizes. 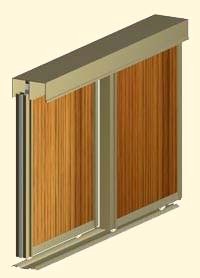 Woody supports highly efficient technology for design of sliding and bifold doors for wall storage. The user selects system type, sets the number of doors, and stiles and rails colors, running gear type and press the Create button. The program automatically generates the system, filling the pre-set dimensions, expecting the dimensions of the door plates considering the stiles and rails profiles and offsets, depending on the rails and running gears type. In the same way as for any other product, Woody generates the dimensioned drawings and specifications automatically. Using the Woody system ensures multiple time reduction for performance of orders, reduces the probability of errors in design and process decisions and exclude errata on the drawings, facilitate optimal loading of industrial capacities, reduction of cost price, resource saving, dramatic increase of work productivity. The Woody system is already used successfully in a number of furniture producer companies. We hope Woody will prove to be useful to many more case furniture producers.